North East England does many things rather well, and one of them is castles. There are dramatic coastal castles, like Dunstanburgh and Bamburgh, grand castles like Alnwick, frontier castles, like Norham, and castles you can stay in, like Langley Castle. 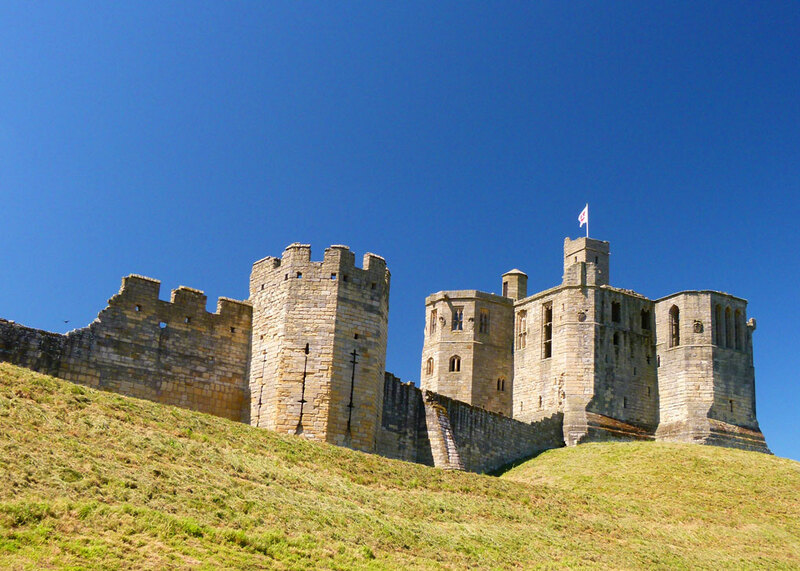 Today, we’re going to take a look at Warkworth Castle, one of Northumberland’s great fortresses. Once a favourite residence of the powerful Percy family, Warkworth is no gaunt border stronghold, built purely for defence, but an elaborate and sophisticated building designed to impress visitors and surround its owners with luxury. 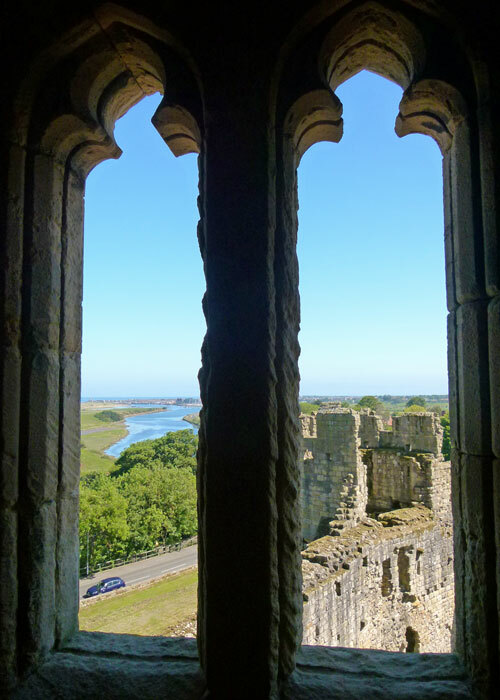 Situated on a loop in the River Coquet about a mile from the sea, the castle is in a natural defensive position overlooking and dominating the large, bustling, attractive village of Warkworth. The old castle walls and towers appear alluringly along the side of the road to your left as you enter the village from the south. Come at it from the north, and you cross a modern bridge next to Warkworth’s medieval bridge, built in 1379 and believed to be the only remaining fortified bridge in England. The castle is a favourite of good friends Kate ‘n’ Steve (aka Steve ‘n’ Kate), who en passant also recommended to Mrs Britain that a visit to Cabosse, a rather splendid chocolate shop, might not come amiss if we were within half a day or so of its door. When I say ‘chocolate shop’, you understand that this is the stuff it makes and sells, not the material it is built of. Out of consideration for anyone watching their weight, we will not dwell on the delights of our short, but pleasurable, stay there, and won’t even mention how wonderfully the hand-moulded, cream-filled, chocolaty creations melt in your mouth as you bite into them… I like to think of the castle as a kind of low fat visitor option; or, perhaps, a means of burning off a calorie or two by walking round its ruins after a visit to Cabosse. Warkworth is a Saxon name, derived from Werceworthe, meaning ‘the enclosure or homestead of a man called Werce’. Whatever Werce’s place consisted of, it was given to the monks of Lindisfarne in 737AD by the then King of Northumbria, Ceolwulf, and included the forerunner of the present parish church, St Lawrence’s – which is itself old enough. The castle is first mentioned in the 12th century, but there is some debate as to whether it was built in the 1140s by Henry, Duke of Northumberland and son of David I, king of Scotland, or by a Roger Fitz Eustace, who was granted Warkworth sometime between 1157 and 1164 by the king of England, Henry II. Either way, it was not much of a castle, because when Northumberland was invaded by the Scottish King William the Lion (David I’s grandson) in 1173, its defences were described as ‘feeble’. They can’t have been any better the following year, when the unfortunate population of Warkworth is said to have been massacred by the Earl of Fife. It is believed that the first substantial castle at Warkworth, then, was constructed by Roger Fitz Eustace’s son, Robert, during the late 12th/early 13th centuries. 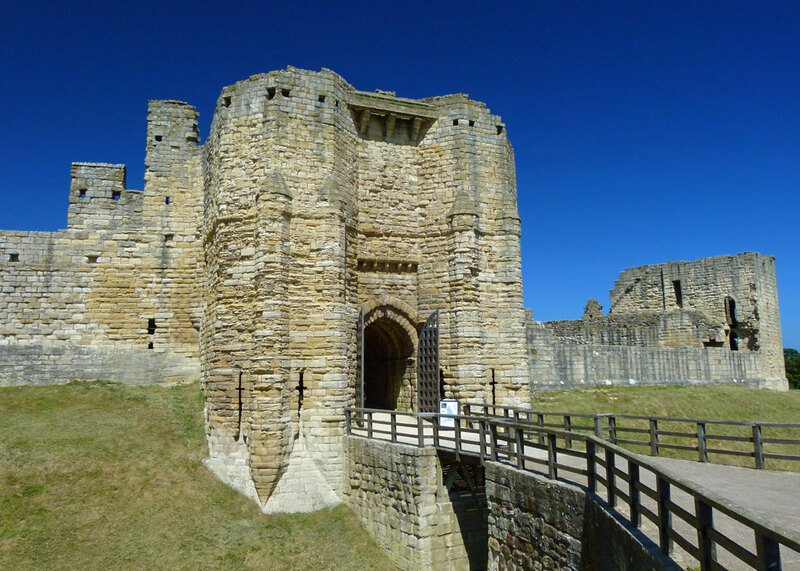 King John visited Robert at Warkworth in 1213 – so do we assume it must have had reasonable accommodation for his royal nastiness? It is probable that Robert’s son, John, and his successors, carried out further building, such that by the time the Scottish Wars of Independence kicked-off in the 1290s, Warkworth had become a notable fortress. It might have played an important part in the defence of Northumberland when, in the aftermath of the English defeat at Bannockburn in 1314, northern England was prone to Scottish attack. Indeed, the Scots besieged the castle in 1227 – unsuccessfully – but they still managed to sack the unlucky village again in 1341. 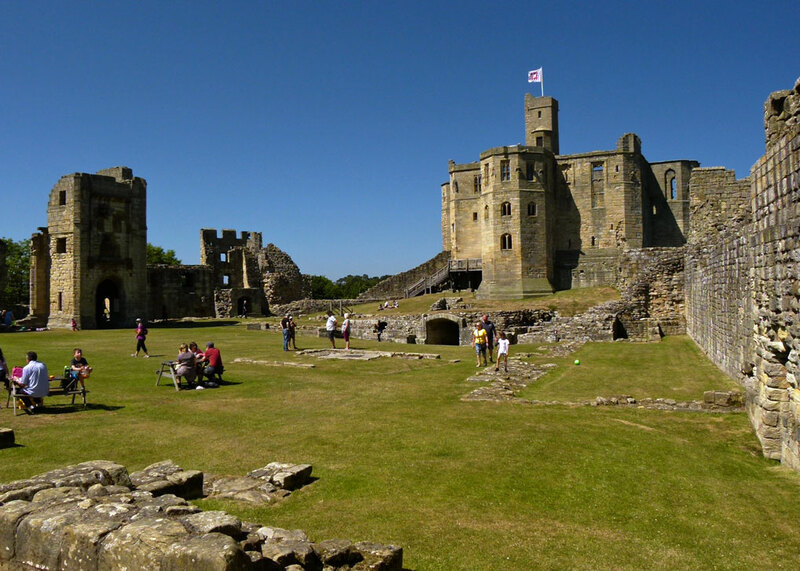 Warkworth Castle’s heyday actually came after it was acquired by the Percys in 1328. The Percy family has been part of Britain’s history since the time of the Conquest, sometimes taking centre stage, sometimes a supporting role. It was far and away the most powerful dynasty in the north of England during the medieval period. Today’s Duke of Northumberland is a Percy (it’s pronounced something like ‘pawcy’ in the local accent) and still owns, and lives in, nearby Alnwick Castle. Anyway, back to the 14th century when Henry Percy (1341-1408), first Earl of Northumberland built the great tower at Warkworth. 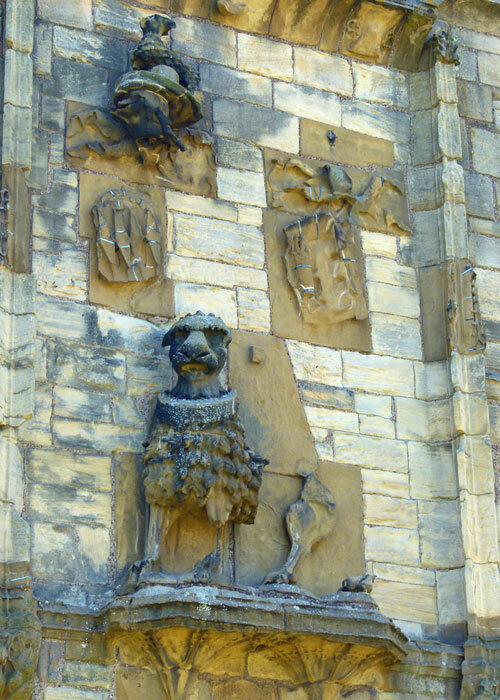 This enormous medieval structure stands at the town, north, end of the castle, where a huge stone carved Percy lion looks down on the main street (Castle Street) – just in case anyone forgets who’s in charge. Apparently, the lion indicates the location of the earl’s bedchamber; it cannot have occurred to the builders that technology would eventually make this into an obvious target; or maybe it did. The great tower is cruciform in plan, with a ground floor, accessible via outer stairs with portcullis entrance, and two upper floors. Inside, it is a wonderful labyrinth of corridors, rooms and stairways. The ground floor was mainly used for storage, but even there are hints of past luxury and wealth. A large stone staircase leads to the first floor, with its reception area, great hall, chapel and kitchen; the second floor was largely accommodation. Towering over all was a viewing tower, providing an uninterrupted 360-degree vista for miles over the surrounding countryside, River Coquet and nearby coast. 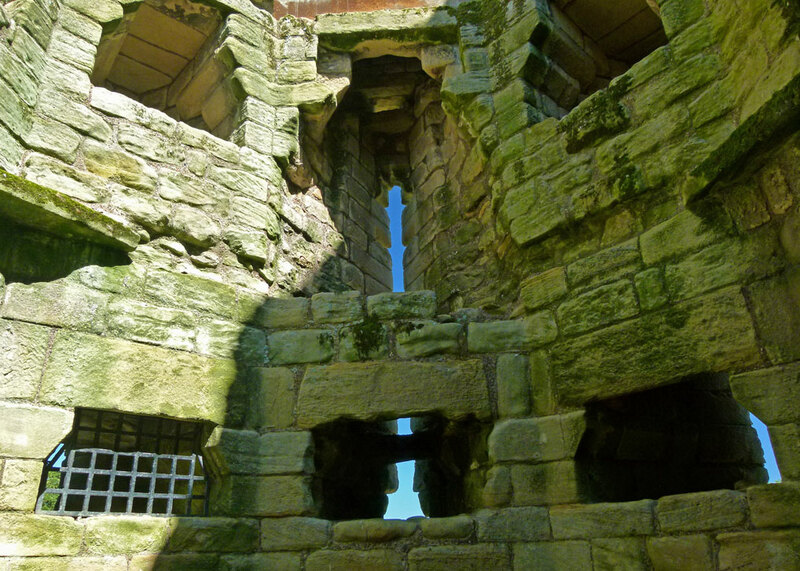 As well as being impressive, Warkworth’s great tower was – and still is in many ways – a beautiful building, with delicate Gothic tracery in the windows, sophisticated drainage and even a light well (if you thought that was a modern architectural device, think again). Henry, the first Earl, was supremely well-connected, being close to John of Gaunt, Duke of Lancaster and third son of King Edward III, until the two fell out. Henry played a part in the coup that replaced King Richard II with Richard’s cousin, Henry IV, but then quarrelled with the new king. The Earl’s son, the Harry Hotspur immortalised by Shakespeare, led a rebel army against Henry and was killed at the Battle of Shrewsbury in 1403. Indeed, Shakespeare refers to Warkworth in Henry IV Part 2 as, “this worm-eaten hold of ragged stone, where Hotspur’s father, Old Northumberland, lies crafty-sick”. Old Northumberland – the Earl – was arrested after Hotspur’s death, but the family managed to hang on to his estates until Percy rebelled again in 1405 and the king seized Warkworth. Nevertheless, his son, Henry V, restored the Percy fortunes and the family were prominent Lancastrian supporters during the Wars of the Roses: the 2nd Earl died at the first Battle of St Albans in 1455 and the 3rd Earl at Towton in 1461. The great rivals of the Percys were the Nevilles, who at this time supported the Yorkist cause. Warkworth Castle was taken by the Yorkists in 1462 and used as a headquarters by Richard Neville, Earl of Warwick (Warwick the Kingmaker), while he systematically smashed Lancastrian resistance at Alnwick, Bamburgh and Dunstanburgh. The 4th Earl (yet another Henry – c1449-89) had ambitious plans for Warkworth, developing a whole suite of buildings, or range, in the south west corner of the bailey. These included another great hall, great chamber, kitchen, chapel and service rooms. Public access was through a magnificent tower, the Lion Tower, on which fabulous family heraldic devices were mounted. Even in their sorry eroded state, they exude authority; originally, they would have been brightly painted. The population of the castle at this point would have been a large one. Records from just after this, at the time of the 5th Earl in the early 16th century, show he had 166 permanent members of household staff, including practical tradesmen like painters, joiners and grooms, as well as more frivolous employees like singers and minstrels. The 4th Earl also appears to have begun building a church inside the bailey, though it was never finished. Its curious, squat, outline and crypt divide the interior of the castle, with a covered passage connecting the bailey and great tower. It was an ambitious project and would have looked dazzling if the vision had been realised. However, Henry was murdered in 1489, allegedly by a mob for the sin of not committing his forces to support King Richard III at the Battle of Bosworth in 1485, thereby contributing to Henry Tudor’s successful grab of the throne. The Percys were staunch Catholics at a time when this was an unhealthy pastime. Sir Thomas Percy, brother of the 6th Earl, was executed in 1536 for his part in the Pilgrimage of Grace, a northern rising against Henry VIII’s suppression of the monasteries. The 7th Earl was involved in the Revolt of the Northern Earls against Elizabeth I in 1569. 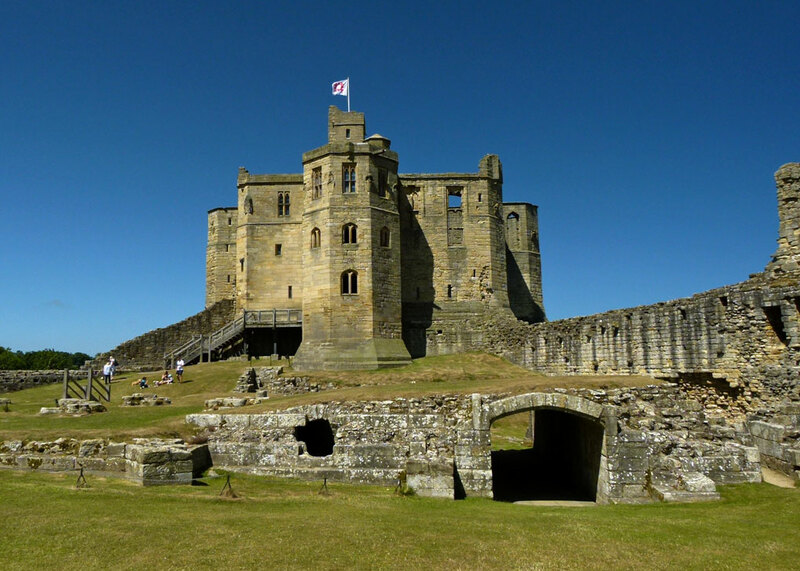 Warkworth was seized by the Queen’s forces (and pillaged) and the Earl, having been imprisoned by the Scots and sold to Elizabeth, was executed. The 9th Earl was imprisoned and fined for possible links with the Gunpowder Plotters of 1605. 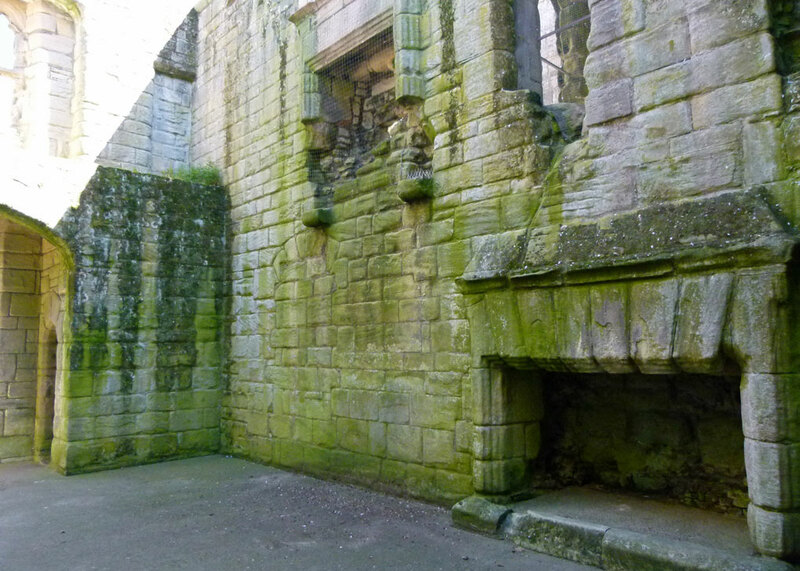 Abandoned by the Percys as a prime residence, from the 17th century, Warkworth Castle’s story is a familiar one: decline, destruction, tourist attraction (with an option to be painted by Turner), followed by partial restoration and, finally, renewed life as a modern heritage attraction. By the time James I/VI visited Warkworth in 1617, the castle was in a terrible state, with livestock being kept in the buildings. Even so, the Royalists occupied it during the Civil War of 1642-48, but it was surrendered to the Scots in 1644 and then garrisoned by Parliamentary troops in 1648. The Parliamentary troops removed fittings when they left so that the castle could not be easily refortified. Later that century, it was plundered for building materials to put up a new house for one of the Percys’ estate officers. During its early tourist attraction phase in the 18th century, Warkworth Castle was indeed painted by Turner. Some attempt at restoration was then made in the 19th century, when the site was cleared and the 4th Duke, Algernon Percy (1792-1865) commissioned the architect Anthony Salvin to repair part of the great tower, creating a suite known as ‘the Duke’s Rooms’. The rooms were maintained for use by the family for outings well into the 20th century. Allegedly, they are open to the public, but the good folk at English Heritage kept very quiet about that when we visited – and I confess to not even knowing about them until afterwards. This is an appropriate moment to mention ‘the Hermitage’, a chapel and priest’s house adjoining and hewn out of nearby cliffs along the river. It is thought to be a private chapel built for the 1st Earl in about 1400. Access is only possible by boat, it looks absolutely fascinating and I was very much looking forward to visiting it. Unfortunately, I can’t tell you much about it, because that too was closed. Both exclusions from our Warkworth experience strike me as possible examples of classic British arcane logic of the ‘not open when the sun shines on the fifth Wednesday after grovelmass’ variety. Or maybe they’d lost the keys. 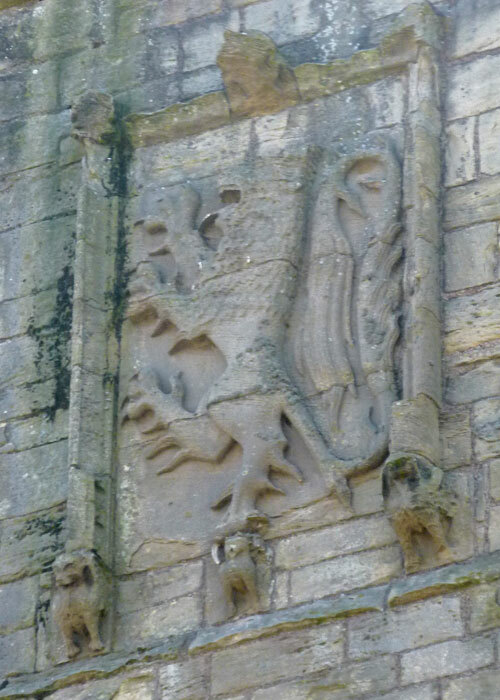 Fortunately for English Heritage, of which I am generally a fan, I need to revisit Warkworth. It’s the kind of place to spend more time in than we did, mooching along the river, sampling the pubs, popping into the church; and if there’s time, the Hermitage and Duke’s Rooms. Don’t know this area very well so pleased to read and see your post. There is something about castles isn’t there! What a beautiful complex. Semi-unrelated question: Did English castles have moats? Moats seem like an extra piece of protection. Always a good thing. Thanks for the pictures. We have stayed near Wooler twice but the last time was about 17 years ago. Time for another visit, methinks! 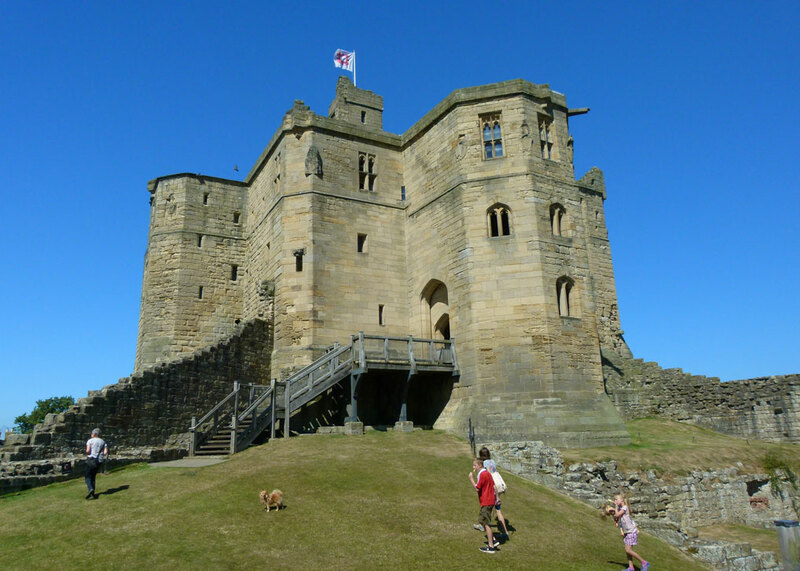 We visited two or three castles because our younger daughter loved them (she still does) but not Alnwick or Warkworth. 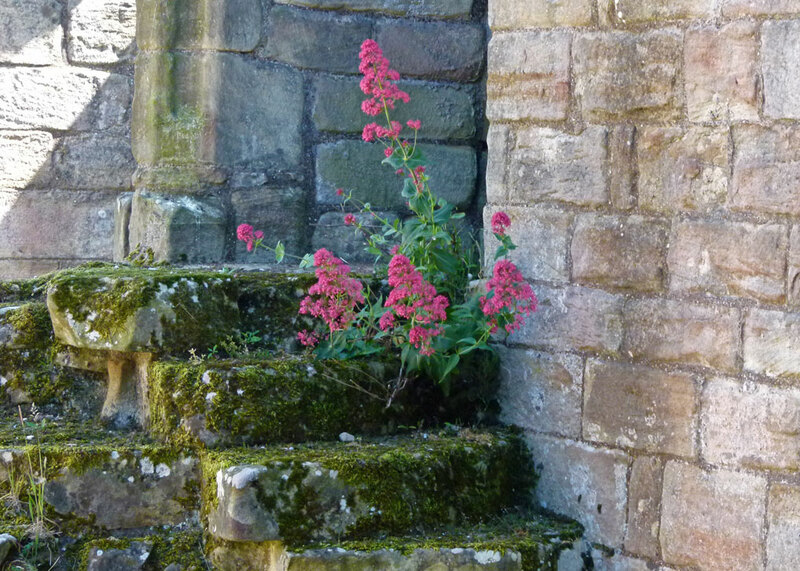 The view from the top of the tower is superb and I love the artistic photo of the stairway with Valerian! Wonderful post! Looks like a splendid place, and seems as if you might have visited during that long hot spell we had? I do intend to revisit Northumberland, which is where many of my ancestors come from, but what with being out of commission quite a lot of the summer, and with more things planned, I don’t think it will be possible until the winter. Eek!!! Grandma never felt the cold and I think it must have been something to do with her bracing upbringing there… Anyway perhaps I can find a particularly cosy b&b, let me know if you come across one. You just want to go back for more chocolate. But, what an imposing place! Very beautiful. You caught me out, Lisa! I would love to visit more castles next time I’m in England – such a great post packed full of history! Love the pictures too. This is one castle I don’t believe I’ve ever seen before – Thanks! We drove through Warkworth on our recent visit to Northumberland but on this occasion didn’t visit the castle. I enjoyed the castle when I visited on a previous occasion. The Hermitage and Church are on my to do list as I haven’t visited them. We discovered Warkworth by accident when we holidayed at Cresswell this summer – beautiful, fascinating place, and our children had lots of fun exploring the old rooms. We certainly made use of our English Heritage membership during that holiday! The Duke’s Rooms and the Hermitage would have been two main attractions to me, for sure, and especially getting there by boat! Sorry for the disappointment. Good thing there were pubs nearby. P.S. I really like the Percy lion faces. Much more impressive than a wreath on the door. Mike@bitaboutbritain, thanks for the article post.Really thank you! Great. I saw from your first commenter that John of Gaunt was her ancestor, supposed to be mine too. Wonder how many descendants he has? It boggles the mind, mine anyway. Would love to visit the ruins of this castle. My favorite photo is the one of the view out the window, where you can see the sea. And not forgetting the chocolate shop, which I would make a point to visit. Go back enough generations and we’re probably all related anyway?! 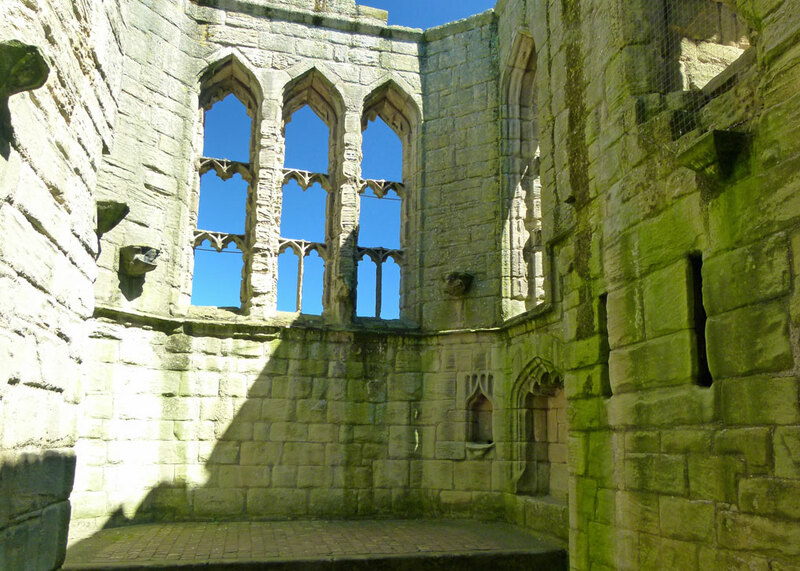 Two weeks ago…was here on castle grounds with friends, visiting beautiful, ancient Warkworth. Coffee and cakes, mosey to castle, stroll along the River Coquet. Well done! Well done! We thought it was a smashing place too! wow I imagine it was quite impressive in its heyday, interesting enough John of Gaunt is one of my ancestors. I bet it was amazing in its heyday – impressive enough as a ruin. You have a gateway ancestor to John of Gaunt? Fascinating! 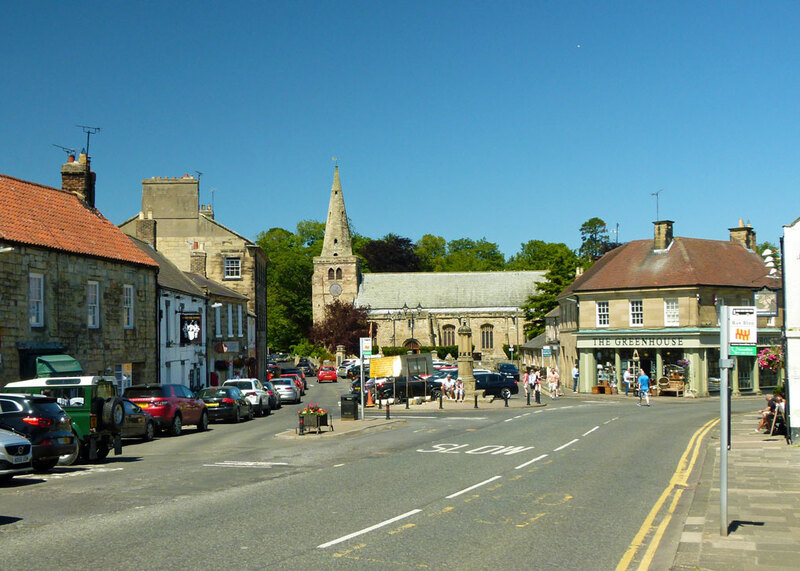 Alnwick a few years ago. But why would a family require another huge castle at Warkworth – not as a summer refugee, surely. Families like the Percys could have as many castles as they liked and could afford. One would be a favourite at different times. Cool to see it through your eyes. I’ve done a couple of posts on Warkworth in the past as it’s in my neck of the woods, and also got to do the boat trip to the Hermitage which was well cool! Lovely pics and great info Mike. Lucky you; as I say, a revisit is called for – if only to try the pubs for size! Quite an impressive place. You’ve photographed it beautifully! What an amazing place. It’s a shame it’s at the other end of the country to me. I find the Percy family very confusing. One day I’m going to have to draw a family tree. I find most aristocratic trees fairly confusing – too many similar names. As you say, the only thing is to draw a family tree – maybe they have one on the Alnwick website? There’s a family tree on Wikipedia. There was a straight run of 10 Henrys. No wonder I get confused. Good luck with visiting the Duke’s Rooms and the Hermitage on your next visit.